Metro Blue Line Florence Station will close again for upgrade work this weekend. The closure will begin tomorrow evening and last until the end of the service day on Sunday. During the closure, crews will install a new station canopy, paint, tile and audio/visual enhancements. Next weekend, work will move to a segment of track between Artesia and Del Amo Station, before wrapping up at Florence Station the weekend of May 22-24. The following service changes will be in affect on the Blue Line as work at Florence occurs. Friday, May 8 after 9 p.m. through Sunday, May 10 close of service, bus shuttles will replace rail service between Slauson and Firestone Station. This means southbound Blue Line trains will return north to 7th Street/Metro Center at Slauson, and trains originating in Downtown Long Beach Station will travel only as far north as Firestone. Customers wishing to travel between Slauson and Firestone will need to board Metro bus shuttles (marked as “Blue Line Shuttle”) in order to do so, and should allow extra time to complete their trip. For some customers, using a combination of the Green and Silver Line will make for faster travel between downtown and South L.A. 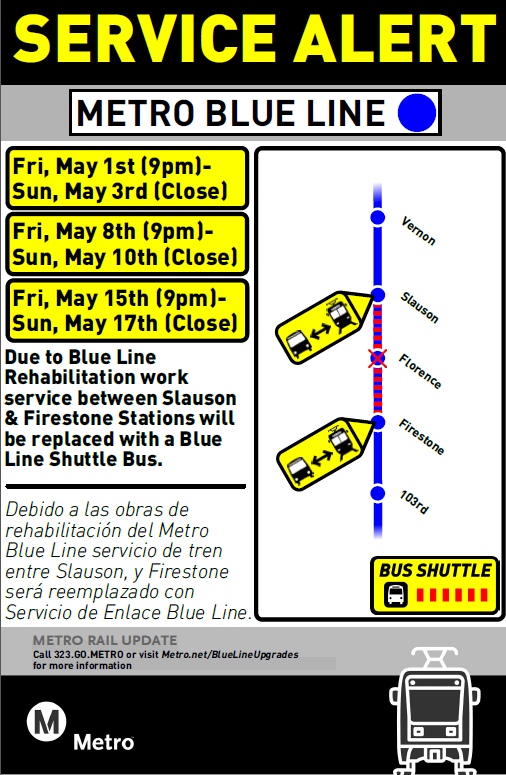 In addition to the bus shuttles between Slauson and Firestone, work this weekend will require the following changes to Metro Blue and Expo Line service levels. (These changes are also posted on our Planned Service Advisories page.) Please note that due to the dynamic nature of construction, the below schedule may be subject to work-related delays. To begin, this Friday after 8:30 p.m., Blue Line will run every 10 minutes between 7th St/Metro Center and Slauson, and every 15 minutes between Firestone and Downtown Long Beach Station. Expo Line will operate every 10 minutes until close, beginning at approximately 8 p.m., but trains will not arrive at their regularly-scheduled times. On both Saturday and Sunday, Blue Line trains will run every 20 minutes between 7th St/Metro Center and Slauson, and every 15 minutes between Firestone and Downtown Long Beach Station. Expo Line trains will arrive every 12 minutes throughout the day. Many are already aware that adjustments to Blue Line service this year have been, and will continue to be, necessary for the completion of the Blue Line Upgrades project, a $1.2-billion overhaul including station improvements, track replacement/refurbishment, and even, eventually, new rail cars. Some of the upgrades have already been completed at stations between 103rd St/Watts Towers and the Long Beach Loop, and will continue to move north along the Blue Line throughout 2015. The estimated wrap-up date for the entire project is late summer. That being said, Metro recognizes that these service changes can be a nuisance, and would like to say thank you to all affected customers. The end goal to keep in mind is a safer, more reliable, and updated Metro Blue Line for years to come. Please check back here at The Source, or follow us @metrolosangeles or@metrolaalerts for the latest Blue Line service updates.